Figure 20.1. 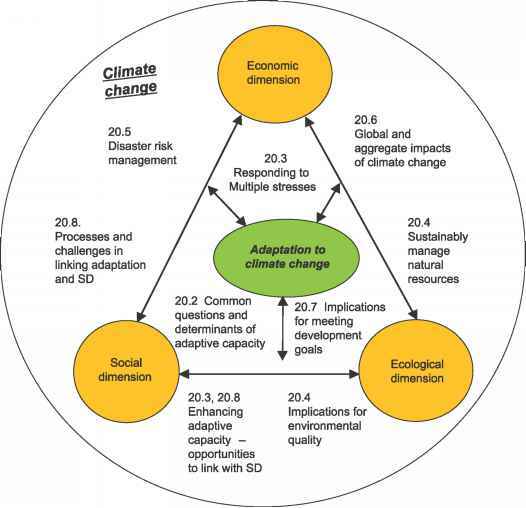 Sustainable development and adaptation to climate change. An outline of Chapter 20 is mapped against the pillars of sustainable development. 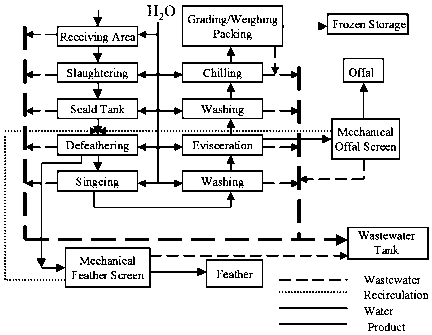 The figure is adapted from Munasinghe and Swart (2005). and Brooks and Adger (2005) - a list that includes access to economic and natural resources, entitlements (property rights), social networks, institutions and governance, human resources and technology (Chapter 17, Section 17.3.3). It is, however, important to note that recent work has also emphasised the fundamental distinction between adaptive capacity and adaptation implementation. There are significant barriers to implementing adaptation (Chapter 17, Section 17.3.3) and they can arise almost anywhere. The description offered by Kates et al. (2006) of the damages and costs caused by Hurricane Katrina in New Orleans, denominated in economic and human terms, provides a seminal example of this point. Notwithstanding the widely accepted assertion that the United States has high adaptive capacity, the impacts of Hurricane Katrina were fundamentally the result of a failure of adaptive infrastructure (improperly constructed levées that led to a false sense of security) and planning (deficiencies in evacuation plans, particularly in many of the poorer sections of the cities). The capacity provided by public and private investment over the past few decades was designed to handle a hurricane like Katrina; it was the anticipatory efforts to provide protection prior to landfall and response efforts after landfall that failed. Nothing in the recent literature has undermined a fundamental conclusion in Smit et al. (2001) that "current knowledge of adaptation and adaptive capacity is insufficient for reliable prediction of adaptations; it is also insufficient for rigorous evaluation of planned adaptation options, measures and policies of governments." (page 880). This conclusion is often supported by noting the uneven distribution of adaptive capacity across and within societies (Chapter 17, Section 17.3.2), but strong support can also be derived from the paucity of estimates of the costs of adaptation (Chapter 17, Section 17.2.3). While many adaptations can be implemented at low costs, comprehensive estimates of costs and benefits of adaptation currently do not exist except, perhaps, for costs related to adapting to sea-level rise and changes in the temporal and spatial demand for energy (heating versus cooling). Global diversity is one problem in this regard, but there are others. Anticipating the discussion of multiple stresses that appears in the next section of this chapter, it is now understood that climate change poses novel risks that often lie outside the range of past experience (Chapter 17, Section 17.2.1) and that adaptation measures are seldom undertaken in response to climate change alone (Chapter 17, Sections 17.2.2 and 17.3.3).